The structure of the frame is strong and light, thanks to the high quality of the steel it is made of. Our cargo bike is fast : with a full load it travels at an average speed of 13 km/h (8 M.P.H.) moving swiftly in traffic and running up and down pavements; with no load it speeds at about 20 km/h (12.50 M.P.H) with no fatigue. Our cargo bike is also safe: it stands by itself and the fact that in traffic it is not necessary, in order to keep balance, to put your feet on the ground is a great advantage. In addition, car drivers cannot ignore your presence, since our cargo bikes are very visible, despite their size being smaller than a scooter’s. We also offer an electric assisted pedal solution with bottom bracket engine, making Trike-go even easier to be ridden, even uphill. The tricycle described in this configuration does not make any noise and does not pollute. The cargo bike with large front box carries up to 100 kilos (220 lbs), keeping absolutely stable and riding quickly. It is assembled in water proof marine plywood, one of the most technically valid, valuable and durable panels. Its performance characteristics make it particularly suitable to be used under severe usage conditions. It can be painted or finished with bee wax / topglass flatting, in order to keep the particular grain of the wood. TRANSPORT OF CHILDREN up to two benches can be added in the front large box in order to transport children. In winter a water proof cover can be added; in summer, using the same structure, a sunshade. COMMERCIAL TRANSPORT for commercial transport the large box can be supplied with a sheet cover or a raised one. 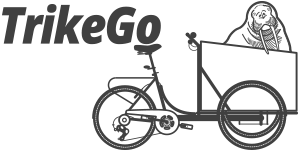 The TrikeGo is also available without the front large box, allowing who has special needs to satisfy them selves as necessary.